The situation in Europe is getting very interesting with the possibility of bank runs beginning soon in Greece. So I was very interested when I received the following prophetic warning today from Michael Perritte. In the dream I was in a classroom. It was as if I was there for career day. I had my hardhat on from the oil field. I was speaking to the class telling them about my work in the oil field. Immediately the entire classroom shifted to the right. After the shifting I was still in the same classroom, but I was now standing behind a large wooden teachers desk, which was not there before. Also, my Atlanta doctor, who is from Australia, was seated at this desk, right in front of me with his hands clasped in front of him. He didn’t make a move. It was as if he was very focused. Also, there was now a bookshelf on the wall behind me, which was not there before. So it was not only the classroom that shifted, but the topic too. I was no longer talking to them about the oil field, but now it was about Germany. I was born in Munich, Germany. 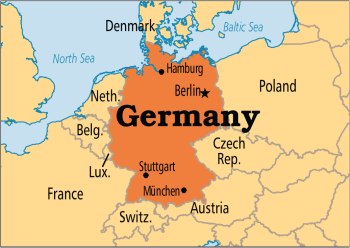 I turned to my left to grab a book off of the bookshelf to show the class a map of Germany, but when I reached to grab it the book was thrown to the floor with the same force as the hardhat. That was the end of the dream. Michael believes the dream was a warning of two big events coming soon. The hardhat getting thrown down to the floor represents a big drop coming in the oil field in North Dakota. The book about Germany getting thrown to the floor represents a big drop coming in the German economy. By February 2015, just one month after the dream, the oil field business in North Dakota started collapsing. What was a boomtown dramatically slowed down resulting in many layoffs and people being forced to leave town. Now, six months after the dream, the possibility of a Greek default and exit from the European Union is putting Germany’s economy in great danger. Michael believes Germany’s economy is going to drop soon. He believes the shifting of the classroom was a time reference. The first drop in the oil field occured during the previous school year. The shift to the right indicates the end of that school year and the shifting to the start of the next school year. If that is the correct interpretation then we can expect to see the German economy drop during the coming school year. I said if that is you please confirm it with scripture. I was immediately given Rev 3:8. When I turned there it said the exact same thing, much to my amazement. I have felt God was going to open doors for me. Simply waiting on him and trusting him has been challenging. This time in the oil field has been like Joseph’s prison for me but God has been faithful and blessed me abundantly. My biggest remaining question from this dream is what does my Australian doctor represent. The country? He never said a word to me and he’s a very personable fella. I’ve gone to him for several years. Michael’s dream is consistent with a prophetic vision received by David Wilkerson in 1973. He saw a coming collapse of the German economy, which led to a global economic collapse. I shared the details of his vision in my recent post, David Wilkerson: Global Economic Collapse Begins in Germany. Germany is the economic engine currently keeping the rest of Europe from going under. When Germany’s economy drops, Europe will go with them. I agree James but I was looking for one big event and the demise of both the oil industry and Germany has been step by step leading to a complete collapse. Both are in complete turmoil and chaos right now. I believe both are true, a series of steps is leading us up to a big event. Was just reading about Nisan 17 and returned to revisit this dream and give a recent update. Just this past week the Holy Spirit spoke to me that this dream had been fulfilled. I suppose I was looking for a complete collapse of both the oil industry and Germany but I was shown that the demise of both began shortly after the dream and has continued a downward spiral until this very day. Deutsche Bank appears to be hemorrhaging internally while trying their best to hide the bleeding. So I agree they have been reeling for a while now. However, there remains an ultimate end to this game, which includes an outright crash that brings about an end to the euro and the European Union. Michael, Merkel is a lap dog, an asset of the neo-cons running America. I highly recommend Paul Craig Roberts, former Asst. Secretary of the Treasury for Ronald Reagan. He is the only person I know who has a clear understanding of what is happening on the geo-political level. These psychopaths and sociopaths are poking Putin in the eye trying to start WW III in the Ukraine and in the ME. France seems to be the only country in Europe not toeing the neo-con line and supporting Russia’s legitimate campaign against ISIS. I have been having dreams about France recently, which all suggest serious trouble coming there. However, I am still waiting for more clarity before sharing any details. France is one of the four countries Gabriel told Terry Bennett to be watching, besides Greece, Italy and Spain. They will say yes to the A/C. I returned to read this post of the dream I was given. As a continued fulfillment of this dream I was laid off from my oil field job in North Dakota and returned home which I believe was an aspect of the classroom shifting and myself shifting with the classroom. Seems the next aspect of the dream to occur would be some significant event in Germany. Syrian refugees pouring into Germany could very well be an aspect of Germany’s demise. I have to wonder what is motivating Merkel’s decision making processes just as I do Obama’s. Also to note is my Australian doctor in the dream. This too has taken a personal turn although I don’t know if it is limited to that alone. He has changed his practice to where it operates much more like social medicine which I am familiar with from living in Germany. The only way you can see him now is by buying into a comprehensive plan which may be represented by how he was so focused and set and impersonal in the dream. As I have continued to ask for understanding of what my Australian doctor meant in the dream especially considering his actions. His face was set like flint, hands glasped, no movement whatsoever. I believe it is exactly what Australia needs to do as they see Germany and the EU unravel. They will be called upon and tempted to step into the melee but they must resist or it will be to their demise. I agree. The doctor is who we call when we are in bad shape. Australia will be called, but I hope and pray they do not answer the call, just like the doctor you saw. Sounds like Germany’s Deutsche Bank is suffering tremendous loses. Perhaps it wont be Greece that brings about the collapse..? ?Is it me or is everything that can be shaken being shaken!!?? Only the kingdom of our Lord and King cannot be shaken! He will rule and reign forever! a man of God speaking into these things in August of 2014 said, Australia was going to have pressure put on them to help with the financial crisis in Europe. When these things start to happen, he said, start praying that Australia will not do it, because it is not the will of God. It is not in the heart or mind of God for Ausralia to do this. Could the ‘ australian Doctor’ be representative of Austalia being looked to to ‘fix’ or ‘mend’ the crisis? Just a thought. I believe you are absolutely right! Had my first dream that ever had anything to do with possible future events. Not quite sure if it was a prophetic dream or just a random dream, but i remember turning on the T.V. and seeing the headline that hillary clinton won the presidency. In the dream, i felt absolutely shocked because i did not expect her to win at all. It was a total shocker. I was also feeling sorely dissappointed because I felt she was the worst possible choice. Not sure if there is any substance to this but thought it was worth a share. I think John Paul Jackson said once the new currency is already in the bank vault awaiting the day the devalue the dollar, which has happened many times in history. You will get so many new currencies for so many dollars. At a loss of course ! Get to know your neighbors and make a plan for tests and trials so you can have peace in the storms that are coming. You don’t want to go to hell for shooting someone who needs food or water or shelter . Narrow is the path and FEW there be that find it . I hear 2.5 people get to heaven, out of 100 that are in hell for eternity . Not worth trying to save your life and lose your soul. Seek God and ask him what you should do . If you have lots of stuff , God will probably ask you to give to the needy. He likes to further his Kingdom by giving stuff to the lost. He can multiply your storehouse while you bring in the lost sheep .Prepare your heart now so you won’t fail the test. It’s going to get hot and testy . Let Jesus show up in your fire. Love and Faith will get you to the pearly gate. It is very interesting that this is mentioned because Neville Johnson in 2014 called people to specifically pray that Australia *not* help when asked to do so. Australia will be a place of financial refuge.